Well the first semi final came and went without any real drama. There weren't any real shock qualifiers. I thought Switzerland would qualify ahead of Hungary. I think Albania probably got in on the jury vote and poor little Montenegro and San Marino - yet to see the final. It's always quite difficult to judge who is singing well when in the arena and how a song comes across on television is always very different. It was a tense moment when Ireland was the last country called - big relief all round at RTE! I was fortunate enough to be asked to join the BBC3 crew to give my views on the show. It was a great experience and I really enjoyed it. Slightly awkward at times though as it was so noisy in the arena. Having watched it back, I now realise I need to smile more! I was called all the names under the sun on Twitter - creepy was my personal favourite. I prefer sleazy myself! It was a fantastic experience and I am very grateful that I was given this opportunity. I'll be on tonight, immediately after the results are announced. As for tonight, I think this is the stronger semi and there could be one or two upsets. With five former Yugoslav states together it'll be interesting to see how the votes are split. Will Sweden's Loreen win this semi? Will she just miss out? We'll know in a few short hours! Security has been really strict here over the last few days. It's taking quite a while to get into the press centre as they're searching everyone thoroughly. On Tuesday night there were plain clothes security guards sitting in the audience. There weren't exactly difficult to identify as they were watching everyone like hawks and looking thoroughly miserable! There are armed guards with sniffer dogs patrolling the arena and warships on the horizon of the Caspian sea. The other night I had an unfortunate incident with a taxi driver who ripped me off. Given that it was an official taxi, I thought it would be fine. Alarm bells started ringing when he was incredibly reluctant to put on the meter and then when it came to paying the swine claimed I gave him a 1 AZN note when it was a 10. It could have been worse of course but still a little irritating to say the least! Last night a group of us went to a bar near the old town. It's basically gay or gay-friendly - a little illicit but interesting nonetheless. There were lots of transvestites and transgender women there along with local men. I got chatting to one of the lads there and he was telling me that life as an out gay man is incredibly difficult and so most choose to conceal their sexuality. Not so different from other places then really. Don't ask, don't tell. Of course I'll probably be completely wrong! Enjoy the show! Tonight is the night! It's the first semi final of the 2012 Eurovision Song Contest! The excitement is building and it's shaping up to be a great show! It's been an interesting few days here in Baku. There was an unsanctioned protest in the city centre yesterday which was very swifly controlled by the police and several arrests were made. It serves as a reminder that some people feel aggreived with life here in Azerbaijan. The people of Baku continue to be warm, friendly and helpful. A few of us called into McDonald's the other night for a quick burger (terrible I know!) and a group of young Azeri lads sat down and started to chat to us. They were so nice and really interested in hearing where we were from and what we thought of Baku. I get the feeling here that people seem more excited by all these visitors to their country rather than the contest specifically. Somehow I don't think you would a group teenagers in Birmingham or Bristol pulling up a chair and asking about Eurovision! The security outside the arena is very strict, there are police everywhere and warships on the horizon! It's unclear whether that's just the way things are done here or if the authorities are a aware of a specific threat. Eurovision is a large international event after all. As for the qualifiers tonight, I am increasingly clueless! I've heard the songs too many times. With so many strong entries this year, we could be in for some surprises! I'm due to be interviewed on BBC3 tonight after the songs, fingers crossed all goes well! A bit of a delayed update to the blog today. Things are getting more and more hectic here as more people arrive. The atmosphere is building but so too are tensions. The opening party was a fun night but as a party it wasn't up to much. It seems that the Azeris have been working so hard on building the arena that they forgot to plan the ceremony. There was no sense of occasion and the usual hassle to get served at the bar. Given the money that Azerbaijan have spent this year, it seems like a missed opportunity to promote themselves. I've been interviewing some local Azeri people who appear to be more excited by the fact that there are so many people here and interested in their country rather than Eurovision itself. In general people have been very friendly and continue to say "Welcome to Baku". If I didn't know better I would think that they had been told to say this at every opportunity! Apparently Armenian music has been officially banned in the Euroclub after the awkward situation the other night. It's difficult to know the truth of the matter. I think given the context, the absence of Armenian music in Azerbaijan might not be such a bad idea. Sunday morning was a struggle. One or two sore heads were walking around the press centre. In the evening I went to the Serbian reception which was superb. It was a classy event with a sense of occasion, everything the official opening ceremony was not. The Serbian singer Zeljko performed several of his songs, a true artist. I was talking to a lovely Bosnian lady and she was talking about the war in the Balkans and that music is the one thing which unites people. It might sound corny but surely that was the whole point of Eurovision? I then hopped over to a gig arranged by Sing For Democracy, calling for recognition of human rights in Azerbaijan. It was a covert gig and I was a little nervous at first but was pleased that I went. Eurovision is a bubble and some people here don't want to talk politics. There is a real issue here though. We are here working in the media in a country that has journalists in prison for criticising the government. In the UK we take it for granted that we can have an opinion and have it heard. We don't live in fear that there might be repurcussions. I salute those peope who organised the event and wish them all the best as they continue to put themselves on the line. It is worth mentioning though, most people here seem perfectly happy. This isn't North Korea. The days are merging into one right now - I intended to go to Ralph Siegel's dinner party too but in the end there was no time. By all accounts I missed out on a surreal and special evening. I've got a big list of notes but heading into the first dress rehearsal now - more tomorrow! Well I've been in Baku nearly a week now and feel like I've lived here for years. I've finally sorted out my sense of direction and even know how and when to argue with the taxi drivers! Progress indeed! I walked to the arena this morning - in glorious sunshine - and managed to get burned and step into a deceptive puddle. It looked about half a centimetre deep and turned out to be a crater of clay! Messy! I asked one of the gardeners to hose the shoe down and he went one better, he put it on and used the jet spray. Poor chap got soaked in the process but he was happy to help. The locals here have been so helpful and continue to work throughout the day and night in preparation for next week. A disabled toilet has appeared in the press centre. When I say disabled, a sign has been placed on one of the doors and railings have been inserted. The cubicle however, has not been widened so it's somewhat pointless and clearly an afterthought. The Ralph Siegel party is actually on Sunday - I'm hoping to go! So another night in Euroclub it was. The DJs are mixing Eurovision music with more dancy stuff and it seems to be working. Unlike Moscow there the lack of Eurovision music really made the Euroclub a disappointing place to be, here in Baku, there is an attempt at compromise. I often wonder what the security guards think of the delegates at Eurovision - loads of camp queens flouncing around and dancing to bizarre music. The volunteers also continue to dance the night away and are always great fun. A slightly awkward moment came last night when Armenia's 2010 Eurovision entry, "Apricot Stone" was played in the Euroclub. I've never seen a dancefloor clear so quickly! Some Azeris did stay, although it's unclear if they knew what they were dancing to. 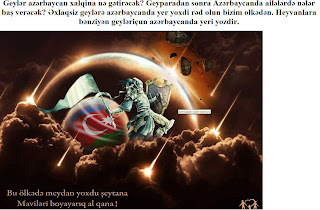 Another young lad ran around waving the Azeri flag vehemently. Politics is never far from Eurovision. The UK delegation are flying over tonight and will rehearse tomorrow. Then of course it's the opening party. More later! They say that Eurovision not a sprint, it's a marathon. How true that is. Nearly a week in Baku and the tiredness is starting to creep in. I've been pacing myself though and not been drinking all that much alcohol (it's true!) Quite a lot of people have been a bit iffy over the past few days, myself included, we aren't sure if it's the different food, the heat or the booze, or maybe a combination. A little tip if you're planning on coming to Baku - bring imodium with you! Traffic in Baku is mad, and so are the drivers. The shuttle bus to the arena is definitely the easiest (and safest) option. Each bus leaves with a policeman (or someone in a uniform anyway) sitting with us for the journey. Every time I board, I'm asked where I'm from. It does seem that people here are genuinely interested and curious about the thousands of visitors to their country. I've found the locals to be really friendly and helpful despite some unscrupulous taxi drivers trying their luck! "What will gays bring to Azerbaijan? What will happen in Azerbaijani families after gay pride? There is no place for immoral gays in Azerbaijan. Leave our country. No place to stay in Azerbaijan for gays who look like animals. There is no place for evil in this country. We paint blue to red blood". Personally I do not feel unsafe here and in those sorts of situations you just need to keep calm and carry on! Of course security is tight and there are lots of people in suits circling the arena but all these attacks did was to send the rumour mill into overdrive. If you put enough Eurovision fans/press together in the same room a story will appear from somewhere. Usually it's completely made up, sometimes it's not. One of the ones I heard was that there are secret police mingling in the crowds for our safety. Who knows? Let's hope for everyones' sake that this event passes off peacefully. On a slightly cheerier note, the Georgian party took place in the Euroclub last night. I'm not a fan of red wine but given that the Georgians had invited us to sample their local wine I thought it would be rude not to! It was absolutely delicious! Alongside the wine and food, the Georgians treated us to shots of chacha, a strong "vine vodka". As is customary at many of these parties, our hosts also put on a show. Several acts took to the stage (Belarus, Malta) and of course Georgia's own Anri. All in all, a fine evening. Georgian parties don't disappoint and they are now becoming the highlight of the Eurovision party circuit. The Georgian party in full-swing! Tomorrow evening I've been invited to a party hosted by Ralph Siegel to celebrate 30 years since his victory in Eurovision with "Ein Bischen Freiden" in 1982. I can't seem to find my invitation though, it's probably under a pile of clothes in the apartment, it remains to be seen whether I'll actually make it! More tomorrow! Baku has the horn. All the time. The car horn that is. The noise is constant and becoming a little irritating. Once one starts, they all start! I don't really know why they do it as it surely doesn't make a difference to the traffic. I guess we'll get used to it and at least I have my ear plugs. Rehearsals are continuing - today was the second half of the second semi final. Things are starting to take shape here in Baku. The shuttle buses are running and the pavements outside the arena are nearly there. I think it'll look stunning next week. Amazing progress has been made since I arrived last Saturday and I dare say that more progress will be made in the coming days. Georgia took to the stage today and the general feeling here is that it's going to qualify. Georgia have never failed to make the final and certainly know how to stage their songs for maximum effect. By all accounts it's a stunning country and I would love for Eurovision to be there one year. I asked the delegation about the importance of Eurovision for Georgia and they were very forthright in their response stating that as a small country they have a lot to offer but what they lack is a platform and Eurovision offers them this. "This is our chance to show ourselves to Europe" according to Maya, the head of delegation. They also said that it is Georgian policy to take part in every major event to promote Georgian talent and the state itself. Maya added that every year the Georgian Public Broadcaster ensures that there is a national element in their Eurovision entries, whether it be a costume or a flag and this year is no different. What people really wanted to know though, was where and when would the Georgian party be? Every year Georgia hosts THE party of the Eurovision season. Indeed in 2010 it rivalled the official welcome reception! The Georgians are fine hosts and always prove themselves to be the most hospitable of all the Eurovision delegations. I don't see the 2012 event, which takes place tomorrow night, being any different. Estonia also rehearsed yesterday. Which of course, for me, was the highlight of the day. I am a wannabe Estonian and I admit it - I did get a PhD out of my love of that country after all! Of course I will always wave the Estonian flag at Eurovision regardless of the song but this year the song is actually my favourite. "Kuula" is stunningly good and Ott Lepland has a brilliant voice. The performance was hampered by a few technical hitches but was still impressive. Coming after the more uptempo performances of Georgia and Turkey, this really stands out and I can see this doing very well indeed. It's been ten years since Estonia hosted Eurovision and the team stated that whilst the contest has changed, the significance of hosting a large international event has not diminished. The Estonians are a very professional and self-assured bunch and you can clearly see the similarities between Estonians and their Nordic neighbours in the way that they carry themselves. The press centre is gradually getting busier and the promotional items have started to materialise. Azerbaijan are getting in on the act too and there is an abundance of books and magazines revealing the delights that this country has to offer. Coupled with the tea served in national costume and the traditional snacks, it is clear that the Azeris are not wasting this opportunity to showcase their country. I am a little annoyed with myself though - I bought one of those Baku magazines in WH Smith and it cost me a fiver! Here in Baku there are hundreds of copies going for free! Typical! Tomorrow it's the Georgian party - I think there might be one or two sore heads on Friday! All the days appear to be merging into one. I seem to have lost track of what is going on in the real world. The perils of the Eurovision bubble! We've finally worked out where the shuttle buses to the arena leave from (the very plush Hilton!) Getting to the hotel was more than a challenge. You would think that crossing a road would be simple but not in Baku. The cars kept on coming and coming and coming. When in doubt follow what the natives do; just step out in front of the on-coming traffic and hope that they stop. When in Rome and all that. We lived to tell the tail and boarded the shuttle bus to the Crystal Hall. There is more food available in the press centre (at a small charge) and coffee has arrived. It seems that slowly but surely things are becoming more organised. Outside the landscaping is continuing and the pavements are nearing completion. They're working day and night in preparation for next week. Security is pretty tough and airport-style checks are in place. This is the only press centre where I've noticed that the security officers have guns. I'm not sure if this is just the Azeri way or if it's as a result of some sort of threat. On the streets, people continue to stare. Eurovision delegates are a curious attraction. In the local mini market several school girls piled in to speak to us and in general people have been very friendly. One thing which is notable is that I've not seen much in the way of people begging or stray dogs for that matter. Could it be that the rumours of "cleansing" the streets are true? Several YouTube videos suggest that culls have taken place and beggars removed from the city centre. Who knows? Another day of rehearsals. Ukraine was the most highly anticipated of the day. Gaitana is in my opinion, the best singer in the contest. She's a belter. As for the staging, whilst it was only the first rehearsal, it looked a bit "busy". After she was selected to sing for Ukraine, Gaitana came under attack from politician Yuriy Syrotyuk who claimed that she failed to represent "organic Ukrainian culture". In other words she's a bit too black for his liking. I asked Gaitana about her response to this. She said that it was the first time in her life that she had experienced overt racism in Ukraine and that whilst she was initally devastated, she chose not to respond and kept a diginified silence. Gaitana is a classy lady and a fine ambassador for her country. It's interesting that she is the first singer of African origin to represent Ukraine, with their Euro 2012 anthem, in the same year that there are concerns over racist football fans overshadowing the matches. In the evening I went to meet up with some locals who had befriended many of us on Facebook. We went to a local bar and learned about life in Azerbaijan. Later on it was decided that we would go to the Euroclub for a bit of dancing. You can't get into the Euroclub without accreditation. However our new friends somehow managed after one of them phoned their father. It seems that money and connections speak louder than regulations here. Tomorrow Estonia, my adopted country, take to the stage. Stay tuned! Things are really starting to come together here. Slowly but surely the arena and surrounding areas are being finished. Whilst in terms of organisation things are still a little chaotic, there are long delays in rehearsals and the wifi in the press centre is unreliable, things are starting to take shape here. Today saw Russia's first rehearsal and what a rehearsal it was. The Buranovskiye Babushki are simply delightful. Only the Russians could have 20 people on the stage for the first rehearsal. They appeared to have a musical director, choreographer and stylist up there, continuously providing instructions. Eventually, when the six grannies were left to it, their performance built into a heart-warming display. The staging of this is so effective and the old girls are so endearing. Their press conference was a hoot and of course the biggest cheer went to the little old toothy one. Each of these ladies has their own story and it would be fascinating to hear more about their lives. Ireland's Jedward took to the stage yesterday and seem to be using a water feature which looks like it belongs in a garden somewhere in Wiltshire. I have a feeling that they have a few tricks up their sleeves though. John and Edward are incredibly savvy and know exactly what they are doing. They are funny and witty and their press conference, whilst chaotic (they came in throwing popcorn around), was the most fun of the day. Linda Martin was there too - she was paying close attention to the camera angles in the rehearsal - they know exactly what they are doing. Linda looks amazing and so much younger than she did in 1992 and 1984 for that matter. I very nearly lost my glasses yesterday though after John (or was it Edward?) threw a banana at our table with brute force. I think they're really likeable, even if they did make fun of my accent when I took to the microphone! There was an unsanctioned protest here in the city centre yesterday. The press centre at Eurovision is essentially a bubble though so it was over by the time we knew anything about it. I dare say that there will be more of this in the coming weeks. I think these people are brave if the reports by Amnesty International are anything to go by. Things are finishing late here and Ireland's press conference didn't close until 21.30. A group of us went for a meal and decided to give the Euroclub a miss and have a relatively early night. Me? Early night? I must be getting old! On the way home a few of us decided to stop off at a local bar, The Pirate Bar. We entered into what can only be described as a knocking shop. It was like one of those scenes from a film where everyone looks up and stares, "this is a local bar for local people". One of the more bizarre moments was when a few of the punters took to the dancefloor and proceeded to gyrate in front of a large mirror. They didn't seem to be dancing for fun, but more performing - I wonder if anyone was behind the mirror? There was also an interesting lady (resembling a brothel madam) who kept changing the ashtray on the table even though none of us were smoking. After one drink and several lingering stares, we decided to leave pronto. It's experiences like this though that make Eurovision so unique which is why I love it! After a long sleep I woke up feeling refreshed and ready to start the day. The Crystal Hall looks deceptively close to the city centre. On the walk out there I kept thinking "just ten more minutes". An hour and ten minutes I arrived. The weather was stunning though so it could have been worse. The promenade area is lovely and has a very cosmopolitan feel to it - lots of nice bars with locals having their coffee. The arena and surrounding areas are not quite finished yet. Outside the pavements are still being laid and the landscaping is continuing. Health and safety does not appear to be a word which troubles the Azeris. No hard hats, high-visibility jackets or wet floor signs. There are litterally hundreds of people working in the area aiming to get everything ready for the live shows. There's a slightly manic feel in the air - groups of workers hurriedly planting flowers and not looking up, down, left or right. I hope they're getting a bonus payment! Working hard to get the arena and surrounding areas ready in time. Being brand new the press centre is a pleasant place to be. It's already really busy but large and bright enough to be able to cope in the coming weeks. There are free refreshments (water, fizzy drinks, teas etc) and fruit, nuts and baclava! There are lots of Azeri press here keen to hear what we think of Azerbaijan which is interesting in itself. The volunteers are very attentive and regularly approach the desks asking us if they can do anything to help us. I almost asked one if he would get me a cuppa but then thought better of it!! The rehearsals went well on the whole. It's just a first rehearsal though and so difficult to form any solid opinions. Montenegro has to be seen to be believed - they have a massive donkey on the stage (not a real one unfortunately!) Greece is vocally weak but the choreography is good and of course there's some side-ways Greek dancing thrown in for good measure. Interesting to note that the backing singer appears to be singing most of the song. How very Romania 2009 of them! What is a tad bizarre to a Brit like me is the hand-holding. Straight men kiss and hold each others' hands here. It's quite sweet to see such affection although I dare say that it would turn quite ugly if such displays were mistakenly read as homosexual so beware! The opening of the Euroclub took place last night. It's a very impressive venue and certainly better than Moscow! There's a nice sofa/diner area upstairs and a huge dancefloor with massive screens adorning the hall. Whilst last night it was quiet, this place certainly looks like a perfect venue for Eurovision revellers. The volunteers threw themselves into the spirit of things last night and were so enthusiastic. They were such good fun even if they did win the dance-off! We'll be back tonight for a re-match! Dancing alongside the volunteers was Safura, who represented Azerbaijan in 2010. The rumours of free beer turned out not to be true but the alcohol is reasonably priced and I dare say that there will be 'champagne for everybody' at the opening party! Safura demanded that I pose for a photo with her. Hate when that happens! As far as first days go, it was a good one despite the teething problems at the arena (huge rehearsal delays) and the car horns which seem to be continuously blaring! Greetings from hot and sunny Azerbaijan! After quite a lengthy journey (overnight via Istanbul) I’ve arrived in the Azeri capital. Baku so far, is very impressive. Leaving on the 22.30 Istanbul flight from Heathrow on Friday evening, it was the first time I’ve flown with Turkish Airlines. To say that the staff were slow would be putting it politely. It took nearly two hours for the first trolley to grace the aisle. I’ve flown from Helsinki to Tallinn before which took 20 minutes and yet they managed to serve a cup of tea and flog duty free in that time! However the Turks more than made up for it afterwards – the food was delicious and the booze was flowing. A highlight was when the flight attendant asked Elaine Dove whether she wanted chicken or beef. Her reply: “Gin and tonic”. She said that she didn’t hear what the flight attendant asked. We know better. "Just the one gin and tonic"
We finally touched down in Baku around 14.00 (10.00 UK time), all of us slightly nervous about the visa registration process and what lay ahead. It was surprisingly simple, thanks to the helpful and friendly volunteers who guided us through the process. - Passport checked once again. Close attention was paid to what stamps were already in passports. Could it be that they were looking for anyone who had been to Armenia? Or more controversially, Nagorno-Karabakh? I like to call it Wrexham, it seems like a safer option. The guidebook advises tourists to steer clear of this subject in conversations. The volunteers at the airport were fine ambassadors for their country; friendly, helpful and knowledgeable. They even negotiated a cheaper taxi rate for us! The journey from the airport was slightly unnerving. Drivers here don’t seem to pay much attention to lanes, stop signs or even other cars! Still, our friendly driver welcomed us to Azerbaijan and sent us on our way. We then met Yuliya, a non-nonsense Azeri who gave us the keys to the apartment. We had arrived. Eurovision 2012 here we come! Baku as a city is very impressive although very much a work in progress. It’s clear that there is wealth here and there is a potential for it to be a Dubai of the future. High-rise buildings and marble boulevards meet designer shops and fancy restaurants. However a stroll around the city reminds you that alongside the oil-fuelled boom, poverty remains. You can turn from a plush avenue onto a dusty side street in seconds. The venue for Eurovision, The Crystal Hall, is stunning. Situated on a peninsula on the Caspian Sea, it’s an impressive setting for this contest. The massive National Flag Square, boasting the largest flagpole and largest flag in the world (or is it the second-largest now? ), overlooks the stadium (making it look tiny in comparison!) Even more impressive is the fact that it was built from scratch in just 8 months! It is of course also one of the more controversial venues for Eurovision. More on that in the coming days. The locals have been friendly and eager to help out during the times I’ve been lost or as I like to say "finding my way on the map". One nice Azeri man even gave me some spare change when I was buying a bottle of water so that I didn’t need to break my 20 AZN note. Very kind and a nice start to the trip - I wonder if Londoners will be as accommodating during the Olympics? Baku has certainly entered into the Eurovision spirit, the contest logo is litterally everywhere! Even on the special Eurovision taxis, which we have been advised to use as opposed to the older Ladas. I wonder why? After a lovely evening meal near Fountain Square, it was time to head home. Having been up since 6.30 on Friday morning, I was more than a little tired. I don’t think I’ve ever fallen asleep so quickly or been as keen to head to bed early on a Saturday night! Tomorrow the rehearsals and press conferences begin – stay tuned! Since 2000 the United Kingdom, Spain, France and Germany have all qualified automatically to the Eurovision Song Contest final. Italy were added to that list in 2011 so we now have a "Big Five". Some fans have stated that this is unfair since other countries have to go through the semi finals in order to perform on the Saturday night. Money talks though and the Big Five contribute the most in terms of financing the event and also have the largest audiences. It looks like this rule is here to stay for some time yet. Of course there is the host country too - Azerbaijan - which means that this year there are six automatic qualifiers and twenty coming from the two semi finals. The 2012 Eurovision Song Contest is therefore the largest in terms of finalists since 2003, with 26 participants appearing on the Saturday night. Speculation surrounding who would represent the UK at Eurovision this year varied from the sublime to the ridiculous. Engelbert, in his mid 70s, has not had a top 20 hit since 1976. It would be fair to say that not many people saw Engelbert in the running for Eurovision! When the BBC announced that the UK representative was Engelbert Humperdinck (what a great name!) the fans were bitterly divided. Personally speaking, I think this is a stroke of genius by the BBC. Never before for a UK entry has there been so much pre-contest publicity. The announcement was covered on ITV News (along with some sloppy reporting which stated that the UK came last in the contest in 2011). The BBC will get large viewing figures for Engelbert, Eurovision is first and foremost a television show. It's certainly got people talking and that can only be a good thing for the profile of the Eurovision Song Contest in the UK. As for the song, it's a very simple, effective ballad. "Love Will Set You Free" was written by the team responsible for some of Adele and James Blunt's songs. It doesn't pretend to be something it's not either. There's no doubt that Engelbert will perform the socks off this song and I think the UK will end up on the left-hand side of the scoreboard. I think the juries will appreciate this and with Mr Humperdinck's following in Europe, it might do well indeed. A clever choice by the BBC and patriotism aside, this deserves to do well. France have had mixed fortunes in recent years and despite being the big favourite to win Eurovision in 2011, it wasn't to be. This year they have opted for a catchy up-tempo number and a fiesty performer in Anggun. On first hearing I didn't think much of this but now that I've listening to it a few times I do like it a lot. I think the mixture of sounds might not appeal to everyone though. The video is interesting - apparently Anggun wanted to objectify men for a change - given the sexual orientation of the average Eurovision fan, I don't think there will be many in Baku who would take offence! Italy was the surprise of Eurovision in 2011. Nobody expected them to finish in second place! What a welcome return to the contest after 14 years. After watching San Remo this year, it is clear that Eurovision was an afterthrought to RAI however that does not take away from what is a quality song. Nina is very Amy Winehouse and the song is in her style too. She performs it with grace, elegance and ease. In the fan preview parties this has scored highly and I think it's one to watch. Rome 2013? That sounds good to me! Azerbaijan, the home team. This is a nice song albeit not the most cheery! Sabina has a good voice and performs well. I'm just not sure if it's instant enough to win Eurovision again. I think it'll be in the top 10, as they have been ever since they started entering Eurovision in 2008. I fully expect that the hometown applause for this will be deafening - it's always my favourite part of Eurovision, the atmosphere for the home team is always awesome and I look forward to experiencing that in Baku this year! If Sweden is the fan favourite for an uptempo number, this is the equivalent in ballad form. Initially this passed me by however, after a few listens, this I think this is stunning. Pastora has an incredible voice and if she manages to pull off those notes on the night (which I think she will) this could do very well indeed. I can see the juries lapping this up but will the public? After Germany's victory in Eurovision 2010 they have really upped their game and this year is no exception. "Standing Still" is a simple ballad which builds nicely, it's well-performed by a handsome singer. I can see this doing well with both juries and public. The UK can also claim some of the credit for this too since British musician Jamie Cullum wrote it! Overall, a very strong showing from the Big Five and host country Azerbaijan. If pressed for a winner though, I'd say Italy is in the running. A trip to Rome next year would be very pleasing to many I'm sure.